A large Caribbean island, Cuba forms part of the Dominion of New England in the Anglo-Danish Empire. As such it is described in more detail there. The main French colony in the Caribbean, Hispaniola is part of France-Outre-Mer. Since 1849 it has been a member of Le Pacte d'Amazone. Hispaniola suffered a great deal of damage during the Long War, when the Anglo-Danish Empire made repeated attempts to invade it and cement its control of the entire Caribbean region. However, Hispaniola was able to repel all of these invasion attempts, and remains French. Because of this the economy of Hispaniola is now almost entirely independent on the French military presence on the island, although these is also a small agricultural sector. The colony of Hispaniola also includes the island of Puerto Rico which was taken from the Anglo-Danish Empire during the Long War, as well as some of the other islands of the Lesser Antilles. The capital of Hispaniola is the city of Cap-Haitien. The Central American Dominion of the Anglo-Danish Empire, covering the southern part of Central America from the Mexican border down to and including the northern tip of South America. With their much smaller land borders with the much weaker states of Mexico, New Granada and Casaquiarja, Mosquitia has been much less threatened over time than New England, and so is a much more relaxed and less militarised state than it, although not so much so as to wish to cut their link to the home country. The presence of the Nicaragua Canal in Mosquitia has also made the people of Mosquitia more cosmopolitan, tolerant and ethnically diverse than is the case in most of New England. Because of the major concentration of Roman Catholics in Mosquitia the Dominion, like Maryland and Cuba in New England, has a special dispensation granting its Catholics equal rights with the other official religions of the Empire. Like New England, Mosquitia has national service for all citizens, and significant numbers of military bases, particularly around the Nicaraguan Canal which forms one of the main sources of income for the Dominion. Most of the industry and utilities of Mosquitia form part of the Royal Universal Company, though a significant minority of them are part of the Hudson's Bay Company. Like the other Dominions of the Anglo-Danish Empire, Mosquitia is ruled by a President from the capital of Belize City, aided by his Advisory Council. A nation which seceded from the Spanish Empire in 1797, claiming that Spain had lost its way and no longer had the right to rule. According to the Mexican histories, the Kingdom of Mexico was formed to defend the true principles of Catholicism in the Americas, the principles from which the corrupt and lax Spanish Court in Madrid had deviated over time. Mexico formed a Kingdom under the leadership of its Governor, Gaspar Vasco Dávila, a distant descendant of the conquistador Pedrarias Dávila. He founded the Dávila Dynasty who rule to this day from their capital in Mexico City. 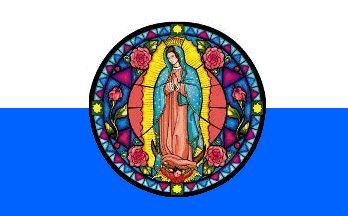 Since its origins Mexico has been a solidly Roman Catholic nation, but despite this has long had military ties to the Holy Russian Empire, who have supplied them with military and economic assistance to keep Mexico safe from the enemies that are seen to surround it on all sides, in return for trade and military cooperation in the Americas. The most feared organisation in Mexico is the Mexican Inquisition, set up under the auspices of the new Mexican government in 1797 to effectively replace the old Spanish Inquisition in Mexico as an enforcer of the religious principles of the new regime and also as a secret police against internal threats to the state. It has long carried out its duties in these matters with zeal and enthusiasm, and it is not unknown for them to covertly operate beyond the borders of Mexico itself when required. The flag of the Kingdom of Mexico is horizontally divided into two bands, of white over blue. These represent the Virgin Mary in Catholic usage. In the centre of this is a representation of Mexican Virgin of Guadalupe [taken from here].